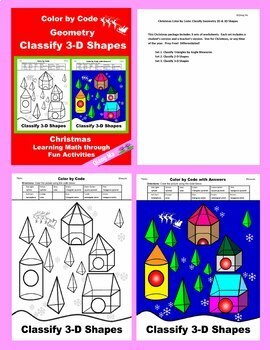 This Christmas Geometry 3D shape classification includes a student’s version and a teacher’s version. They are 11 kinds of solids total. Use for Christmas Day, or any time of the year. Prep Free! Differentiated! 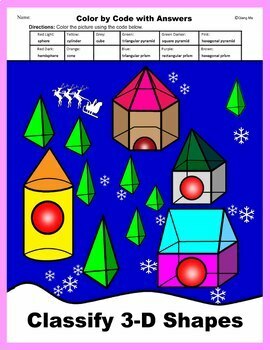 Shapes included: sphere, hemisphere, cylinder, cone, cube, triangular pyramid, triangular prism, square pyramid, rectangular prism, hexagonal pyramid, and hexagonal prism. 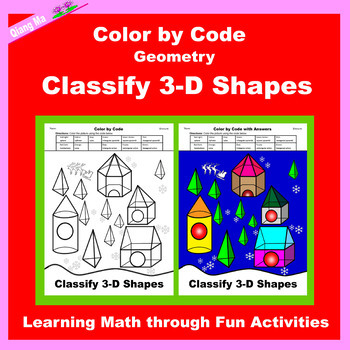 This product is also inside the mini bundle Christmas Color by Code: Classify Geometry 2D and 3D Shapes 3 in 1. Save $$$s when you buy in bundles!